The first view to illustrate the devastation following the Great Boston Fire of 1872. Bird's-Eye View of Boston, Showing the Burned District. 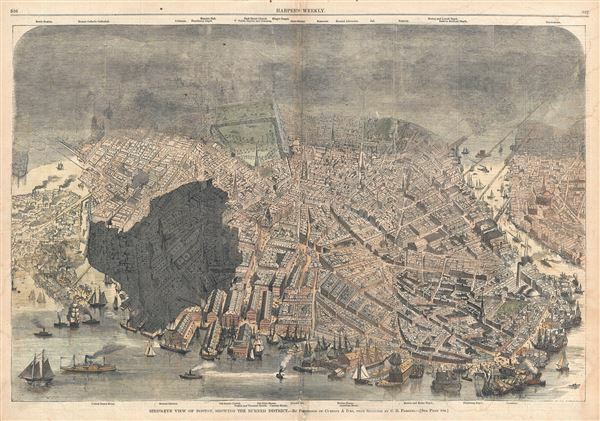 A dramatic journalistic view of Boston, Massachusetts prepared to illustrate the devastation following the Great Boston Fire of 1872. Issued just three weeks after the tragic fire (November 7-8, 1872), this is one of the first publications to illustrate the full extent of the fire. Eager to provide their readers with a graphic representation of the fire, the publishers of Harper's Weekly turned to Currier and Ives, who had contracted illustrator Charles R. Parsons to collect material to produce a grand view of the city. Parson's was in a unique position as he worked for both Harper's Weekly, as head of their art department, and Currier and Ives, and was thus able to consolidate the resources of both firms to produce this urgent view. Hence the present view, published by Harper's Weekly, thus actually predates the famous grand format Currier and Ives view issued one year later in 1873. Moreover, it is considerably advanced over the Currier and Ives View as it illustrates the results of the Great Fire, which the later view disregards. Harper and Brothers (1917 – Present) is New York based American printing publishing firm founded in 1817 by James Harper and his brother John Harper as J. and J. Harper (1817-1833). Their younger brothers Joseph Wesley Harper and Fletcher Harper joined the company around 1926 prompting the 1833 imprint change to Harper and Brothers (1833 – 1962). The firm published countless books, magazines, prints, maps, and more. They began publishing a monthly magazine, Harper's Monthly in 1850. The success of Harper's Monthly led to the introduction of a popular weekly illustrated journal, Harper's Weekly published from 1857 - 1916. They later introduced Harper's Bazar (1867) and Harper's Young People (1879). From about 1899 the business went through a series of permutations selling off some assets and developing others. The company merged with Row, Peters and Company inn 1962, rebranding itself as Harper and Row (1962 – 1990), which was acquired by Marshall Pickering in 1988. It was acquired by Rupert Mordoch (News Corp) and merged with William Collins and Sons in 1990 to form HaprerCollins (1990 – Present), the imprint under which it still publishes. Their original offices were at 331 Franklin Street, roughly below today's Manhattan Bridge. Today they have many offices and are one of the world's largest publishing companies and one of the 'Big Five' English-language publishers. Harper's Weekly, November 30, 1872, p 396-97. Good. Some centerfold wear and overall toning. Backed on archival tissue. Boston Public Library, Leventhal Collection, G3764.B6A3 1872 .P3.